Barnabas was a New Testament character whose real name was Joseph but the apostles gave him the nickname, "Barnabas" which means "Son of Encouragement". We want this website to be a means of encouragement to our fellow believers and leaders. Because we understand that our site is but one of many that seek to encourage other believers. We are just one of a “network of lighthouses” along a dangerous coastline. We hope whatever light shines for you from this part of that network will encourage you on your journey. To be an avenue that supports and stimulates passion for Jesus Christ in the lives of all who have committed themselves to follow Him and to cheer them on life's journey as they seek to fulfill Jesus' purpose for their lives. To encourage those who are currently enduring a season of struggle and weariness to find their strength in God - especially when the winds and currents are making progress hard-going. To be an agent of God's healing for those who are casualties in the spiritual conflict in that they have suffered emotional, relational or spiritual injuries. To sound a warning for those who have surrendered their spiritual "cutting edge" in preference for a safer or more comfortable journey and to encourage them to re-engage with their high calling. 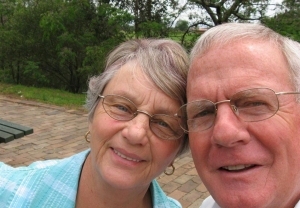 This is the title of the book I have written as a tribute to my beloved wife, Bev. 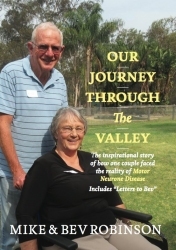 It is the "inspirational story of how one couple faced the reality of Motor Neurone Disease". The book is based upon the "letters to Bev" - a growing collection of letters that have occupied this space since her death in April, 2015. Most of the letters can be found in the book which is available for purchase on this site, through the book order page. The book will prove valuable for peole who are struggling with grief and loss of any kind. But as I continued to read, I realised that her words were those of someone being prayed for by many, many people at the time of her writing. Her God-given heart’s desire was to be a blessing to others and bring glory to Jesus. One of the most real aspects of the book is the way in which Mike, a Baptist Pastor, suffering from Parkinson’s Disease, wrestles honestly with the deepest issues of his heart while never turning his back on God. He becomes a modern day Psalmist – bold, real and edgy, but faithful. He shares priceless insights with his readers that are clearly the product of sustained reflection on life experience and Scripture.